There’s no question that the California state wrestling rankings are some of the more interesting … and most heavily followed in the nation. The nation’s biggest state — a top-five state for high school wrestling in America — and only one class. It’s a three-month statewide brawl from one end of the Golden State to the other. The California Wrestler, which has been covering the state since 1974, released its preseason rankings this week (thanks, as always, to Al Fontes for so diligently sending these out). Most of the state’s No. 1 wrestlers were fairly predictable and we had them pretty well nailed down in the WIN preseason rankings as far as the correct weight class is concerned. Two wrestlers, both underclassmen, are higher than we had them — and that will make for some interesting rankings decisions as we head into the season. 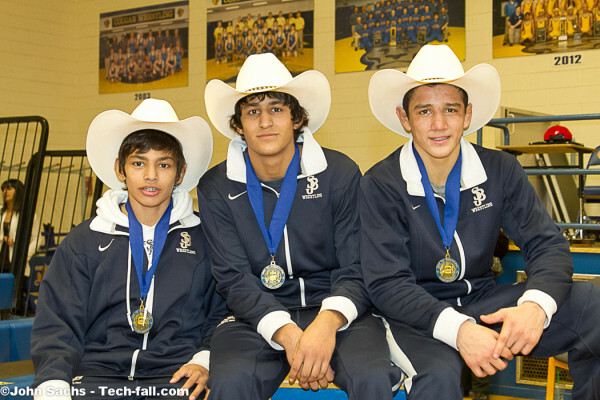 The Valencia brothers Zahid (left) and Anthony (middle) joined St. John Bosco teammate Aaron Pico in winning a Doc B championship last winter. The first is junior Anthony Valencia of Bellflower St. John Bosco. Incredibly, he’s projected to go up three weight classes for the second year in a row. The state champion at 126 as a freshman, Valencia finished second last year at 145. This year, he’ll go for a second title at 170, where his primary competitors are seniors who have already made college commitments. One is another state runner-up, Nick Fiegener of Folsom, who moves up from 160. The other is Bryce Martin of Bakersfield, back at the same weight class at which he finished fourth last year. Fiegener signed with Cal Poly and Martin with Indiana earlier this month. Jumps of three weight classes appear to run in the Valencia family. His brother, Zahid, also a 2012 state champion as a freshman, is projected at 132. He finished third in state at 113 a year ago. He won’t have it easy, though. A pair of seniors, former state champion Isaiah Locsin, who transferred from Morgan Hill Live Oak to Gilroy for his final season, and Old Dominion-recruit Emilio Saavedra of Modesto stand in his way. But it’s the 152-pound weight class which got a lot more interesting nationally. That’s where sophomore superstar Aaron Pico, the high school teammate of the Valencias, is expected to wind up. The state champion at 132 as a freshman, Pico also is moving up — you guessed it — three weight classes. Only two other state place-winners are projected to be at 152: senior Nolan Kistler of Riverside Martin Luther King, eighth at 138 last year, and junior Lorenzo delaRiva of Folsom, sixth at 145 a year ago. Pico was the consensus No. 1 choice at 138, his WIN preseason home. That decision at 152 will be a bit more dicey, since two-time Illinois champion Bryce Brill of Chicago Mount Carmel holds the No. 1 spot there. The Northwestern recruit has been ranked No. 1 for nearly a year.